My Kindle 2 review is up on the Sun-Times site for your glorious edification. I thought some of you might also like to see a few screenshots of the K2 in action. First page of my library. Here be all your books & papers. Basic reading. This is a Fast Company article that Stanza downloaded and converted to Kindle format. Okay, let's go do some web surfin'. Menu...ACTIVATE! Google Reader might justify the cost of the Kindle all by itself. It turns every blog into a Kindle-friendly format, easy as pie. Yes, you can even Twitter with it! The screen really isn't fast enough for long typing, but hey, it works! Happy Pancake Tuesday! AKA, the day before Ash Wednesday on the Catholic calendar. There’s also a tradition that before you start your Lenten sacrifices, you go off and have a rich, hearty pancake breakfast. My UPS guy met me on the way out the door. And what did he have for me? So I kept my date with the diner. But I was Pancaking with my right hand while I was Kindling with the left. 1) Damn, this thing finally feels like a real, richly-designed consumer product. It’s metal, and has that MacBook Air vibe where the case tapers down into thin edges. You get the impression that it’s a lot slimmer than it actually is. 2) Hallelulia! That flimsy cheap plastic back-cover is now gone. The back actually looks like a generation-one iPhone…a vast, unmarked plain of brushed metal, topped by an inch of plastic (where the wireless antennas live, npo doubt). 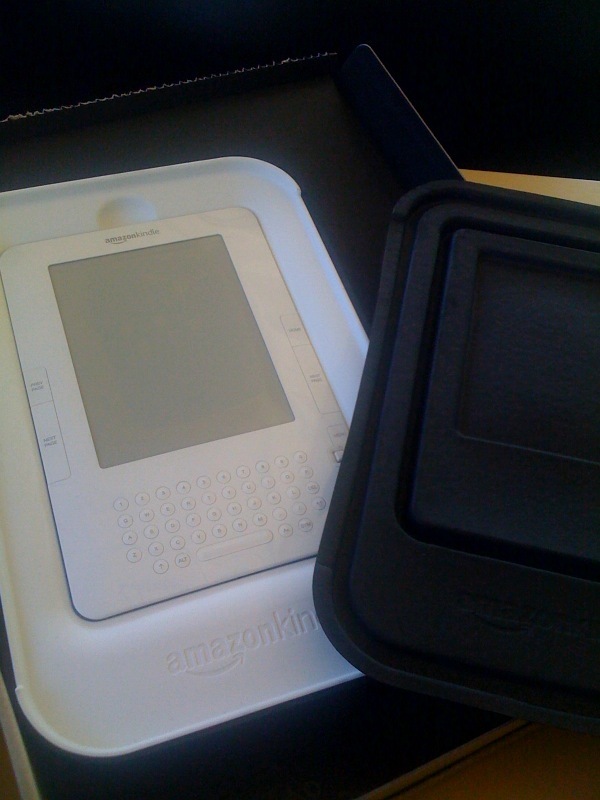 3) The transition from your old Kindle to the new one is simple. Natcherly it knows who you are when it arrives. Click into a setup menu and it re-downloads all of the content you’ve purchased via the Amazon Kindle Store. But none of the docs or public-domain ebooks that you might have emailed into the device will show up…that’s on your shoulders. 4) WhisperSync works fine. I was in the middle of re-reading Michael Palin’s wunnerful Python Diaries on my Kindle 1 yesterday and when I clicked the book on the 2, it opened it to (almost) the page I was on. 5) Text-to-voice is…functional. As expected, it sounds like very, very good text-to-speech. I do think it’s more of a feature for people with vision problems than any sort of replacement for the audiobook edition of a title. But it’s perfectly understandable, if a little American Idol-ish vis a vis artistically and convincingly interpreting and performing a piece. The speaker’s kind of weak. I was in a not-at-all-busy diner and I had to hold it up to my head to really hear it. The speakers are flat on the bottom-backside of the device. 6) The new interface is a five-click joybutton instead of the rolling elevator. But the MO is mostly the same. Instead of having a separate LCD stripe on the side of the screen, the thing you’re about to click on is underscored with a line. It works fine. 7) The device is devoid of all but a single mechanical sliding switch, which powers it up when it’s off and wakes it when it’s asleep. 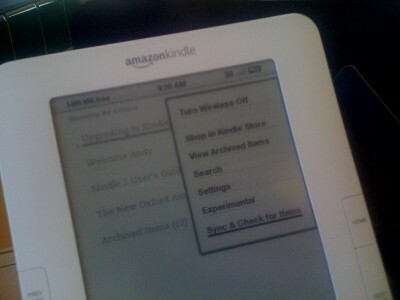 8) I might have to take back my longstanding complaint about Kindle 1’s paddle switches for page turns. It annoyed me that I couldn’t put down the Kindle, take a two-handed bite of my sandwich, and pick it up again without being one or two pages away from where I was. The Kindle 2 has some conventional pushbuttons mounted flush with the surface of the device and I find that I have to push them with a little but of authority to get a buttonclick to register. Whereas the paddles on the K1 responded to a gormless flick of the thumb. (I stress that this is a brand-new, out of the box device. So it’s possible that the K2’s page-turn buttons haven’t been broken in yet. It’s also possible that I’m just used to the feather-touch of the K1. But let it be noted that it’s the first thing that struck me as a step back, after a whole 21 minutes of experience with the Kindle 2). 10) Damn…the “standard as hell” USB connector on the bottom of the K2 is now a “Crap! I forgot to pack the cable that charges my Kindle!” connector. My full review for the Sun-Times will come in a couple of days. My overall first impression is that this is a step forward. The only way to kill it is with a Ticonderoga #2 through its heart! One click syncs all of your K1's purchased content onto your new K2. Note "underscore" highlighting of the item you're about to click. 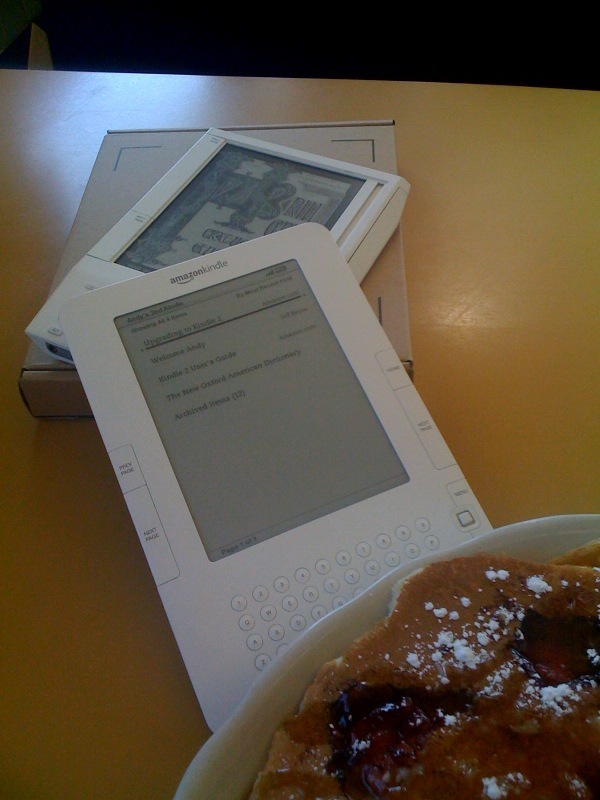 From back to front: Kindle 1, Kindle 2, YUM.